I’ve been working in PowerPoint a lot lately. It made me think about grad school and reading Edward Tufte. If you do a Google search you can read his writing about PPT and the Challenger disaster or here’s a brief essay about PPT being evil from Wired. It’s a fine tool for presentations when it’s used correctly, however, it’s rare that you see a great PowerPoint or Keynote deck. Unless maybe you hired Nancy Duarte. 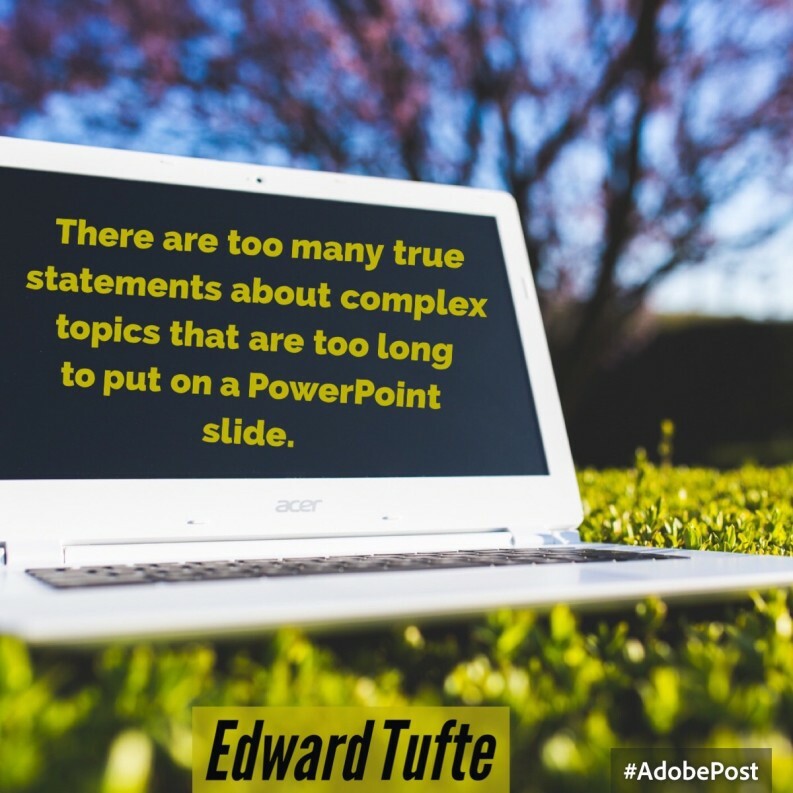 Then if you take it a step further, why is the use of PPT so prevalent in Instructional Design/eLearning? Is it because the MS Office suite is so readily available on every corporate computer? It’s just a tool for our tool belt. Not by choice, I’ve been designing in Adobe Presenter a lot for the last few months – it’s a PPT add-on if you aren’t familiar with it. Adobe Presenter and Articulate Presenter are the same beast. I’ve been talking to my frientor, Thomas Toth a lot lately about “the right tool for the job” – you can check out his blog post here. Do we settle for Adobe Presenter because it’s what our employer provides and it’s not the best eLearning software available? PPT and the add-ons make meh eLearning. Our learners deserve better. If you are a PPT master, Storyline is easy to pickup. Captivate is a little more of a challenge but it’s not that bad. Why not use tools that were designed for the job? The rapid development tools actually save time in the long run. I can build out multiple PPT slides for use in Presenter to set up a clunky interaction that would run smoothly in 1 Captivate slide. Adobe’s monthly fee for Captivate is $29.99 and for $14.99 for Presenter. I wonder if the cost savings is eaten up by all of the extra work to build out fake interactions in PPT decks? Just a thought.